We have been watching the release of the Nexus 4 around the world and the demand has been extraordinary. Now, the Nexus 4 is finally on sale in the Google Play Store in the US, so you'd better move fast if you want to buy one. Word has it that the Nexus 4 sold out in about 30 minutes when it went on sale in other parts of the world, like the UK. 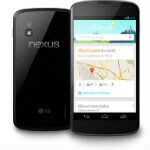 The Nexus 4 is Google's newest flagship Android device. It comes with Android 4.2 Jelly Bean, a 1280 x 768 4.7" IPS display, a 1.5 GHz quad-core Snapdragon S4 Pro, 2GB of RAM, an 8MP rear camera, a 1.3MP front camera, and other bells and whistles like induction charging, NFC, Bluetooth, etc. The 8GB Nexus 4 will run you $299, or you can get the 16GB model for $349. Update 1: Although the Nexus 4 is listed right now, we're running into errors in trying to actually purchase the device. Update 2: Google has removed the Nexus 4 from the store, and it is back to the notification signup. Update 3: Word has it that through the mess of error messages and server crashes, enough people were able to purchase the Nexus 4 to have it sell out just 25 minutes after going on sale in the US. sold out in 3, 2, 1..
That's too much time to spend on one product. I was also online till about 230am last night in hopes of a early morning release. Hey, you wierdos sit in front of iphone stores for days to get one. These things are selling out in minutes. At least I didnt have to leave the comfort of my office. I NEED a new phone, its not just about want. Had to beat the crowds. Once I sell my note, most likely going to pick up one. I was thinking about the note 2, but a part of me still wants a note 2. Very tough decision. I've never stood in a crowded line for an iPhone. It still beats refreshing your computer all night since at least you'll have people to talk to in a line. Too much time to spend on one product? So when there are people who make a long lineee sometimes camp outside a store thats not to much time? We aren't talking about the iPhone. what's so difference with the iPhone.. In fact, this is the device everyone should line up for.. Not some elongated model that finally matched last year's specs..
Wonder if you said the same thing about the people who camped out for a couple days cheering about the Iphone 5. Get out of here man. For somebody who trash talks Android so much you sure comment on every single freaking Android news, seriously get a life first and only then say "That's too much time to spend"
at least we're spending it with some common sense (it's dirt cheap for unlock device) and in the comfort of our home in front of the computer.. Not spending days under the sun (and rain, and everything else mother nature throws) for overpriced gadget from yesteryear.. And yes, even Mother Nature has tried to warn you with the rain and stuff..
Omg am i seeing this right...lol remixfa bought a phone that has a snapdragon processor. When you checked out did it go past the "your purchase will complete momentarily" I'm stuck on that page. Already clicked accept and buy though. Do you receive conformation right away? Same for me, no email notification of purchase. I checked to see in my play account if it had successfully went through and it hadn't so I refreshed and it finally went through. I checked my bank statement to make sure. I'm still waiting for confirmation but I called my bank account and a debit for the amount of the phone was issued. Hopefully it was processed before they run out. I got confirmation right away because I clicked the order button at 1132 when I got back from making new coffee. It went in and out in like 10 seconds and had it ordered with confirmation email. helps that I have my CC on file with google play. just tapped like 2 or 3 buttons and it was ordered. I refreshed at 11:35, then started the order. Took me numerous tries and at one point I wasn't sure if I had bought two phones, or none. A guy on Android Police suggested checking into your Wallet account to check and it was confirmed for a purchase of 1 phone. Having my cc on file probably helped as well. I feel for the people who kept trying, I could tell the servers were taking massive traffic hits. I guess if someone as large as Google is having traffic issues, the popularity of this device must be massive. Gotta be a good sign for things to come in the Android camp.